With berries aplenty in stores here in NC, I’m banking on taming a crowd of hungry revelers with a fruit-studded dessert. 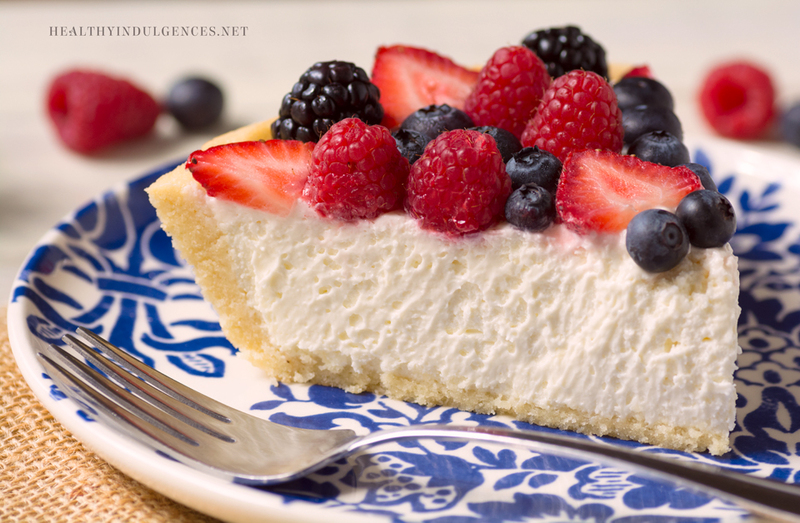 This No-Bake Cheesecake Tart hits all the right notes, with sweet, succulent berries nestled in a tart cheesecake base. Yes, this dessert has calories. No, it is not low fat. But is very low in sugar – perfect for diabetic guests and reformed sugarholics. And because it’s so rich, all you’ll want is a sliver. More important than the kvetching about health specs is the fact that this dessert delivers. The tartness of the yogurt and lemon cuts through the richness of the cream, with the berries adding bursts of sweetness to the mix. It’s a palate-cleansing finish to brats n’ beer. If you’ve been perusing low carb food blogs, you’ve probably seen many variations of this dessert, which is easily made sugar-free. To find the best No Bake Cheesecake, I went straight to Cook’s Illustrated, which is basically the Alton Brown of cooking magazines. They deconstruct desserts and rebuild them from the ground up, crafting elegant explanations for why their methods are superior to the alternatives. The cream cheese is softened slowly in small cubes to ensure a smooth filling free of chunks that would disrupt the silky texture. Gelatin (Great Lakes is my preferred brand, but Knox works just as well) is soaked in cream before being blending into the cheese, lending a light and fluffy texture that holds up long enough in the heat to make it to the picnic table. To complement the zesty lemon flavor notes, I swapped out a cup of cream cheese for tangy, full fat greek yogurt. 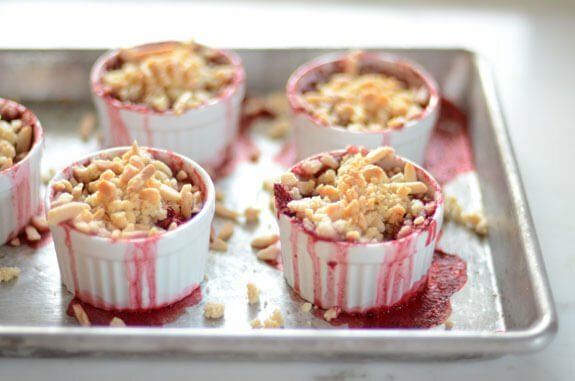 Not that every dessert for special occasions has to have redeeming health qualities, but if you can add an undetectable boost of probiotics that also happens to subtly enhance the flavor, why wouldn’t you? If you can’t find full fat greek yogurt, cream cheese–as is used in the original recipe–works just as well. Since my parents are trying to cut back on sugar (perhaps my incessant rambling for the past 8 years has finally gotten through? Love you, Mom and Dad) this one’s for them. We can’t be together this summer due to my summer research in NC, but at least we can eat the same food on the same special day. One thing I love about food is that it brings people together, spanning space and time. I used a retro tart pan from the thrift store for the crust below, but would have preferred one with a removable bottom for this recipe. When the bottom lifts, it makes unmolding the tart stress-free! 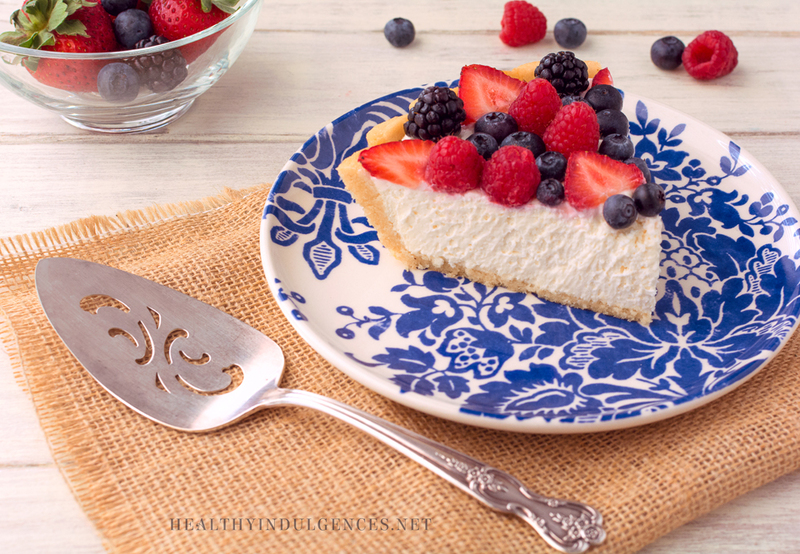 If you’d like to skip the crust, just spoon the filling into elegant custard cups, or even mason jars, layer the berries in between the cheesecake layers. Top with more berries and a sprinkling of toasted almonds and coconut. 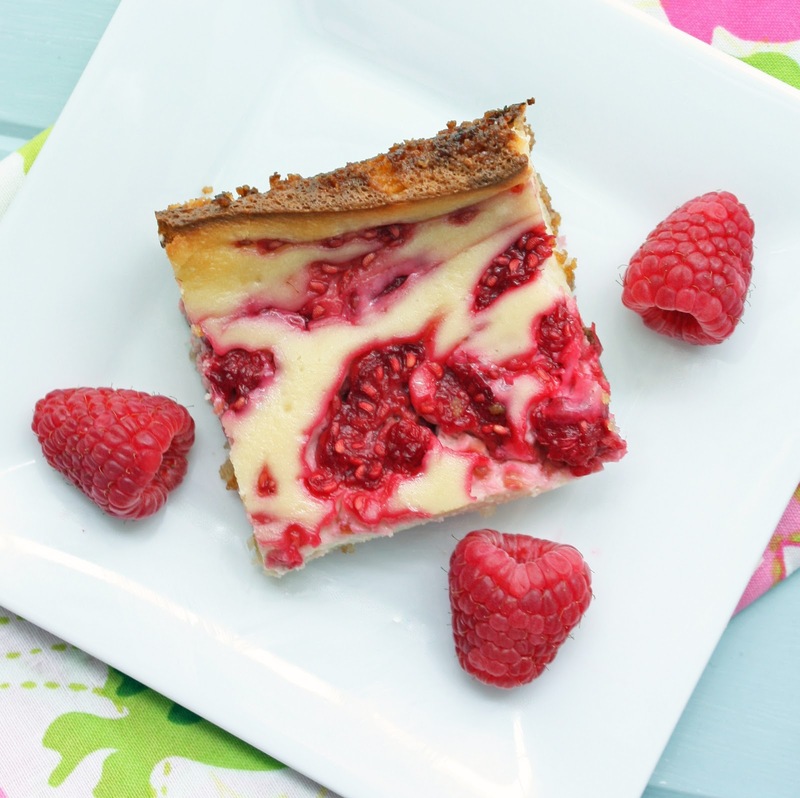 Crustless or not, this cheesecake is still a crowd pleaser! The crust recipe is the same one used for my Paleo Pecan Pie, but with an option to use oat flour now. No rolling out required! Just press it into a tart shell and bake it until slightly golden at the edges. Grease tart shell with a bit of coconut oil, butter, or nonhydrogenated shortening. I recommend using coconut oil or nonhydrogenated shortening since they tend to prevent sticking better. 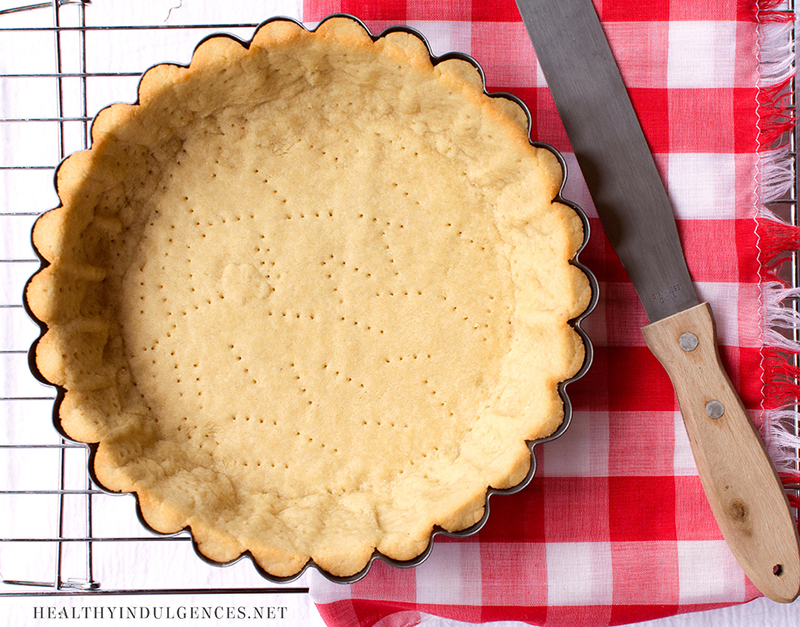 Cut a circle of parchment paper that fits the bottom of your tart shell, and lay it flat. The parchment will make it easier to lift out clean pieces of the tart. Whisk together almond flour, arrowroot starch (or oat flour), sea salt, xanthan gum, and baking powder. Use a fork to cut chunks of butter into the dry mixture until pea sized grains of dough appear. In a small cup or bowl, whisk egg white with a fork until frothy. Mix egg white into dough mixture 1 teaspoon at a time, until you can press the dough into a ball that holds together. Press dough into the bottom and up the sides of the tart pan. Prick bottom and sides of tart pan with tines of a fork. Bake for 10-12 minutes, or until golden brown at the top edges. Cool crust on a wire rack until room temperature. Invert tart pan and the slide out the tart shell. It should come out cleanly. Pour ¼ cup heavy cream into microwave safe measuring cup. Add gelatin powder and whisk to combine. Let the mixture sit until gelatin has softened, about 5 minutes. Return cup with gelatin cream mixture to microwave and heat on HIGH for 30 seconds, or until gelatin in completely dissolved. Set aside. In a large mixing bowl, pour in heavy cream and sweetener. Beat at medium high speed until soft peaks form. This should take roughly 2 minutes. Add softened cream cheese chunks and greek yogurt to whipped heavy cream, and beat about 1 minute on low speed, until combined with only a few small lumps of cream cheese remaining. Scrape sides of bowl with a spatula to ensure everything is combined smoothly. Add lemon juice, lemon zest, sea salt, and vanilla and beat for another two minutes, or until mixture is smooth. To the large bowl, scrape in the heavy cream-gelatin mixture from the glass cup, and beat until light and airy, about 2 minutes. Spread filling evenly into cooled tart crust using a spatula dipped in hot water. Refrigerate for a minimum of 6 hours (overnight is recommended). Cover filled tart with a plastic wrap to prevent a skin forming on the surface. 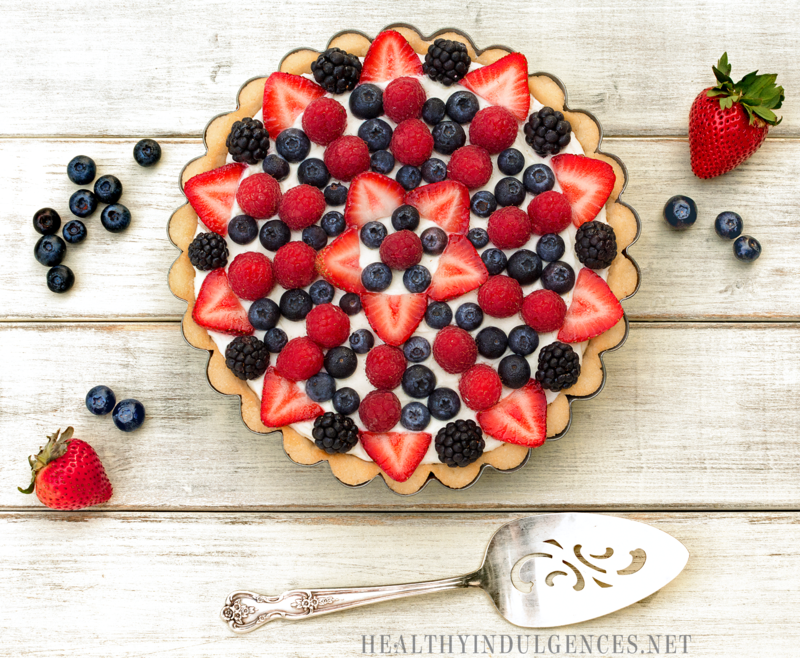 Just before surface, slice up berries and pile them atop the tart. They don’t need to be arranged perfect, until you’re insanely type A about your desserts (guilty!). Alternately, you can use a springform pan to make it look more like a traditional cheesecake. Use the crust recipe from old No Bake Pomegranate Cheesecake. You could also spoon the filling into jars and layer it with berries, like a parfait. Sprinkle with toasted sliced almonds, large flaked cocount, and more berries for a festive garnish! *The sweetener blend I use is ½ cup erythritol + ½ teaspoon Stevia Select stevia powder. If you tolerate xylitol, that it can be used in place of the erythritol. You might want to use a bit less since xylitol is sweeter than erythritol. What’s with the two separate listings of cream cheese? Want to make this,but a bit confused? TJ, thank you for catching my oversight. 🙂 I just updated the recipe for ya. 8 oz cream cheese and 8 oz Greek yogurt. You can also use 16 ounces of cream cheese with no Greek yogurt. Hope that helps! TJ beat me to it! I have lovely fresh berries I’d like to use this weekend. Wrote my shopping list (including a new tart pan) … but am unclear on the cream cheese quantity and instructions. Help? L, I just updated the recipe for ya. 8 oz cream cheese and 8 oz Greek yogurt. You can also use 16 ounces of cream cheese with no Greek yogurt. Hope that helps! Fantastic. On my way to the store. Dessert for tomorrow. Thanks! Eunice, I just updated the recipe! 8 oz cream cheese and 8 oz Greek yogurt. You can also use 16 ounces of cream cheese with no Greek yogurt. Hope that helps! so I just discovered Greek Cream Cheese and Greek Yogurt at Costco. I had never seen this before so I thought that I would pick it up, but haven’t tried it…..I am supposing that I could substitute this ounce per ounce for the cream cheese….what do you think, Lauren? Janice, that should work in place of the cream cheese! So you’d use 1 lb of it (2-8 oz packages). Let me know how it works out for you! How much gelatin if I use Great Lakes?? Packet = ? Pat, sorry I couldn’t get to this yesterday. 1 packet of Knox gelatin is 2 1/2 teaspoons, so the equivalent amount of powdered Great Lakes gelatin should work well in its place. How much sugar total is in a serving ( 1/8 of the cheesecake)? Can you please tell how much i put for 5 people. Your photographs are amazing. Such a lovely pics. Which camera have you used for taking pics.